Peonies produce flowers year after year, sometimes for over 100 years. They are reliably winter hardy most everywhere in Canada, and are a cinch to grow in a sunny location. 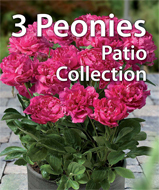 My Patio Collection and miniature double blossom collection combine the best colours with quality bulbs. Do not plant the bulbs too deep. For best results, the eye should be no more than 3″ deep.